Chateau Palugyay in Corkscrew Museum, British Medical Journal and advertising posters. An advertisement from the British Medical Journalpublished by the British Medical Association in 1881. This review of Chateau Palugyay was published in the December 15, 1880 issue of The London Medical Record. 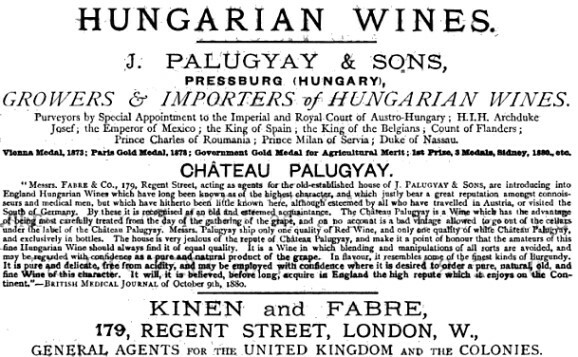 Under this title Messrs. Kinon and Fabre, of Regent Street, the agents for the proprietors, Messrs. J. Palugyay and Sons the famous wine-merchahts and growers of Presburg, Hungary, import an Hungarian wine of very high quality indeed. Many Hungarian wines introduced into this country have had certain drawbacks, either of coarseness or of imperfect manufacture ; and it is only when the highest qualities are reached that Hungarian wines can be fairly said to compete with French wines in perfection of manufacture. This wine, on the contrary, is singularly delicate, pure, and well made, and possesses for the connoisseur a quality equivalent to that of very high-class Burgundy, for which it was recently mistaken by a French grower experienced in such matters, to whom we submitted it. Chateau Palugyay is a wine of rare quality, and will certainly take a permanent place among the favourite wines of all connoisseurs. Physicians often look for a pure, generous, and unsophisticated wine—a thing which is much more often talked of than found—and we believe that the Chateau Palugyay will always deserve what we can now fairly say of it, that it possesses the qualities we have enumerated. Hungarian wines, except those of the highest class, are generally reproached with being somewhat rough and wanting in the qualities of manufacture which are essential to their maturing and keeping, and which probably, in some measure from long 'use and wont' are seldom bound absent in the produce of the French vineyards. 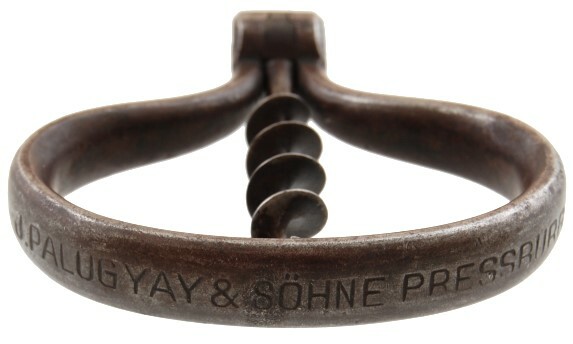 No faults of this kind can, however, be detected in the Chateau Palugyay wine; of a Burgundy character, sound and soft enough to please the most fastidious palate, it is further recommended by its agreeable and characteristic bouquet. 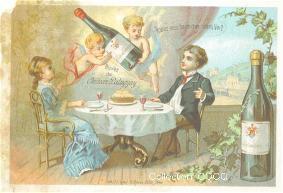 One of the qualities here enumerated, the soundness of the wine, renders it specially suitable as a tonic in cases of anemia and kindred ailments where red wine is needed, whilst its agreeable qualities of flavour will recommend it equally to the great number of persons who habitually use Burgundy wine as the usual stimulant taken with their luncheon and dinner. Should the Chateau Paluyay wine maintain the high standard of the sample which was submitted to our investigation, which we see no reason to doubt, it will certainly gain deserved favour with physician, patient, and public.